We started off the 3rd morning of our New England trip in Bethlehem, New Hampshire just outside the White Mountains (I’ll be sharing soon). We stayed the night at a small B&B called Adair Country Inn, which was just as quaint and quirky as it looks! When we woke up, fog hovered above the ground and when we packed up the car later in the morning, it was still lingering, creating an eery but gorgeous sight over all the fall colored trees. We set off on our drive to Woodstock, Vermont with plans of arriving by lunchtime, but we clearly got sidetracked with one too many stops along the way. How could you not? As we passed Moore Reservoir, we pulled over at the first chance we had because there was a strip of fog above the lake (see image above on the right), and beautiful hills of trees across the water. In the 10 minutes or so that we stopped the thick fog evaporated before our eyes, turning the calm water into a giant mirror. We initially had big coats on in the morning, hence this Burberry toggle coat, but by the time we ended up in Woodstock, the chill was replaced with a perfectly warm fall afternoon. Woodstock was my favorite town we visited during our road trip through New England. We saw so many charming places but this one definitely took the cake. It’s actually picture perfect, every single house and shop and tree and river and Inn. I loved it all! I wish we would have stayed there for at least a night, but sadly we hadn’t known before hand. 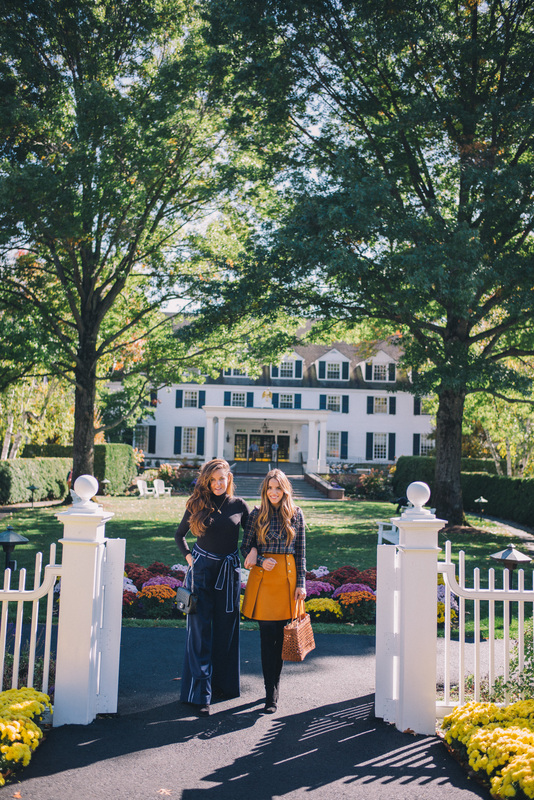 Thomas and I are definitely going to come back here and stay for a few days (maybe at the Woodstock Inn, which looks so cute) and check out more of the surrounding area. For lunch, we went to Village Butcher in town and got sandwiches, snacks and some pumpkin pie to-go and took it to the picnic tables down by the water. This was the warmest day of the trip, so I was glad I packed some lighter things besides knit sweaters and coats. I bought this J.Crew skirt right before we left and really fell for its golden/honey shade. Thomas kept telling me how much he liked that color, so much that he wants to incorporate it into our new place. I found this wallpaper on Anthro, but I’m not sure if I could commit to something that bold. It is really pretty though. On Interstate 91, on our way to Woodstock, we caught a glimpse of a narrow lake with lake houses on the edge. We scouted the map and found out how to get there. Lake Morey is what we had been envisioning our whole trip when we were looking for lakes, so when we saw it off in the distance, we had to see it closer. All four of us agreed that if we were to buy a cabin somewhere, this would be it. I would love to wake up every morning to this view. Put a good book in one hand and a hot cup of tea in the other and I’m in heaven. What a dream! And I love your fantastic look, too! Beautiful pictures! Love the Maje Boots! Your outfit is a perfect match with the landscape! It seems to be such a pretty place! The color of that skirt is perfect! You match the golden leaves :) Seeing your photos is reminding me of the New England road trips I would take with my mom while she was on assignment writing her travel books. I even stayed at the Woodstock inn! It’s really a lovely place. What a beautiful outfit Julia! Have a great weekend ahead girl. Love the way your skirt matches the pumpkins! Adorable. These pictures look fantastic! Also, love your look as always! The photos are spectacular!! Love how you match the background ? Absolutely gorgeous photographs! That J. Crew skirt is beautiful – I love the unique colour & the buttons & pleating detail is divine! That area just looks so undeniably picturesque, it would be a dream living there! Amazing photos, I like so much your beautiful skirt. These scenic views look amazing and so peaceful. Great for a quiet getaway. I’ve never been to Vermont, but it looks like such a gorgeous state!! Gorgeous outfit – and I agree with Thomas, such a great colour!! Such stunning photos! I love the color of the skirt. Wow, this is so festive! Love all the pictures! omg I wish I could see the colors in Vermont with my owns eyes! Those colors are truly the definition of beautiful! The pictures in this post are also spectacular!They show the beautiful colors! Woodstock sounds so dreamy! What a perfect day. I love how your skirt is fits right in with the fall colours! All the pumpkins are so cute!!! What a perfect fall look! We have a trip planned to Vermont next fall and based on your photos we are going to have a wonderful time! Obsessing over the skirt! Adorable. I can’t get enough of these pictures from your trip, fall in New England is amazing! So beautiful!! This makes me want to go to Vermont like NOW! Absolutely beautiful! I love that skirt and love love love all of these pictures! You look adorable. I just can’t get over how beautiful the scenery is!!! All of these fall posts are just gorgeous! It’s not fall down here yet so I’m loving the color through your posts! I have that skirt too and love it! The color is amazing! Julia, I’m from New England (raised in Massachusetts) and my family has a lake/ski home in New Hampshire in the White Mountains. Upon your return, you should stay at the Mount Washington Hotel in the White Mountains next time! It will make for some gorgeous blog photos. The hotel has breathtaking views in the summer and a beautiful spa as well. I also am an interior decorator and you should consider Farrow and Ball or Katie Ridder wallpaper for your new home! They have beautiful shades of that honey tone Thomas likes! All of these places seem so perfect. This is definitely a positive change from San Francisco! Lake Morey looks so serene and beautiful. I love the mirrored effect on the lake—simply puts me at peace. Thanks for sharing! More fantastic fall inspiration! The colors in these photos are just incredible. Love the shots of the lake! The North East is so perfect in fall!! I love the pictures! I’m also wondering: How do you keep the clothes wrinkle-free while traveling? Do you iron your outfit in the morning? Thanks! This look is perfection on you, Julia! Goes perfectly for Fall! You look so gorgeous! I am loving the plaid dress shirts. I have a ton of flannel plaids in my wardrobe, but cotton ones rarely make it into my closet. I am definitely going to have to change that. I think if you did the wallpaper as a feature wall it would look incredible! You are the epitome of fall chic! Love this post. I travel with this portable steamer. 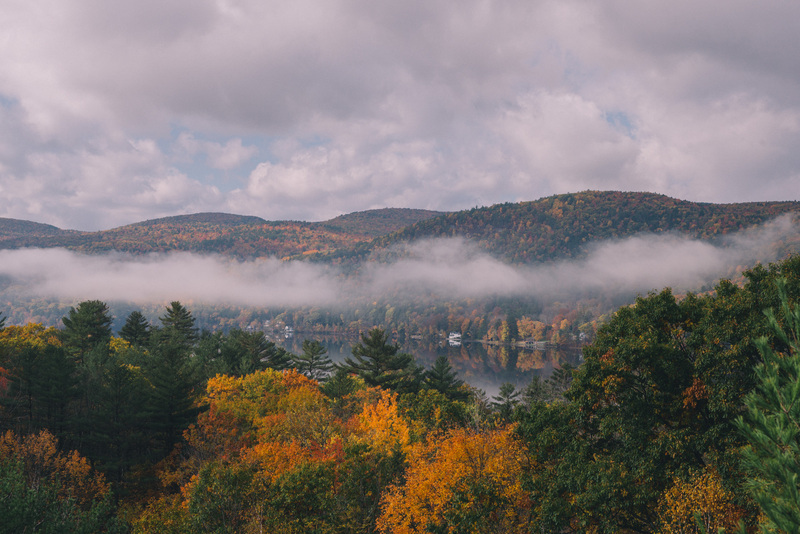 These pictures of Vermont are truly STUNNING. Wow. I live in New Jersey and DC and there is great foliage there but the scale of these mountainous open areas is amazing. I really need to make a trip up there in the fall. These are fall picture perfect!Love them all. First of all, I have to go to Woodstock VT! Such stunning photos! And second of all, I’m obsessing over that bold and feminine skirt. Gorgeous Julia! Again, can’t get over the backdrop. You hit the most beautiful week before the trees started dropping their leaves! Gorgeous outfit as well – I love that skirt. Absolutely stunning photographs yet again!! Love the colors in your outfit! And that wallpaper you’re looking at is so pretty! IT looks so pretty there! Just out of a movie! I love that Anthro wallpaper !! Hi Julia, I’m from Boston and have taken many foliage trips through New England. Gorgeous photos Thomas! I love all the fall colors in this post! I’m dying for fall in California. I love keeping up with all your travel posts, so much inspiration! Que lindo el look, me gustan mucho los tonos naranjas alegren mucho. These photos are gorgeous!!! It really wants me to book a trip to Vermont! Visiting New England in the fall has always been on my list of things to do so I may have to do that next year. I am happy to read you had a fund time exploring the area! Your outfit was perfect for that beautiful scenic backdrop! Woodstock is clearly the most magical place in the country. That bookstore!!! This day looks completely dreamy!!! Wishing NYC would take a hint from Vermont and start blooming such bold colors!! So so pretty! Wow! The leaves up there are just gorgeous! The entire town looks like a movie set. I’m with Thomas – that honey color skirt is stunning and SO fall. You could always put that wallpaper in your powder room! I think it would look great in a small space. These photos turned out to be fantastic. Your skirt is really cute. That skirt is everything! Love it. Wow it’s absolutely stunning there! I love your photos and fall inspired outfit!! What a beautiful little inn! Vermont is always so gorgeous. I am in love with the color of your skirt! So autumnal! Vermont is so beautiful this time of year! The point of your photo at Lake Morey is just a few cottages down from my family’s! It’s the most wonderful spot! There are not other FALL photos like yours! What type of camera do you use? All of your photos are gorgeous!! Relly really beautiful nature and pictures. Lovely!! Wow, this little town is definitely picture perfect! I love how pretty the leaves look, and a cabin next to the lake sounds like the best idea ever! Glad you’re njoying your trip around New England! It really is picture perfect!! How fun! Those lakes look absolutely dreamy. I’ll definitely have to check out Vermont! That town is definitely picture perfect, and I’d love to wake up in a cabin in Lake Morey too! Also, love your outfit! Your photos have me longing for Fall — it’s still in the 80’s here in Atlanta! Your hair looks amazing in these photos! What products do you use for growth and what technique does your stylist use for your color? Thanks so much! so picturesque! didn’t get to visit Woodstock while I was there but it looks like a must-visit next time I’m in New England! What stunning photos and I love your skirt! Your photos of Woodstock, Vermont are gorgeous! I love your fall outfit as well. That mustard skirt is such a great statement piece! I find beautiful scenery, hopefully someday know. I love the Anthro wallpaper! You might like Robert Allen and Thibaut wallpapers as well. Robert Allen would be bright but not as dramatic and Thibaut has a very similar look to that paper! You HAVE to use that wallpaper somewhere in your house! Maybe in a powder room? It’s beautiful! What a darling little town! Your look pairs perfectly with the ambiance of it all. That’s what I was thinking! If not this wallpaper, then definitely another for an accent. She looks so different on the blog! Every picture in this is just flawless, they’re all so cosy and fall-y! Really enjoyed this post! How fun! Vermont looks so gorgeous! Another version of the Latin cross is the 3-Step Cross, where through the bottom of the cross are 3 steps signifying a pathway of faith, hope and love. As long as you hold a zealous passion concerning this type of apparel, you will likely have a lots of fun from a ciel Phantomhive cosplay. Without these components, you do not turned into a good violinist. In 1934, when Jim’s coach and manager Joe Gould offers him an opportunity to return to boxing, he becomes the symbol of hope for hopeless people inside a ruined nation. If you are a tattoo designer, your very best opportunities can be found on the net, or you can get a tattoo shop in your city and work there to the owner of a store, a year out an offer with him to showcase your designs. It has a large audience backing and pays homage to radio programs in the past, in most genres from sketch comedy, to music programs that attracted many inside past.